Not Wildly Different: How animal welfare can inform gender equality | The Forum Network, hosted by the OECD: Shape ideas. Shape policy. Shape the Future. For most women around the world, equality is still out of reach. Laura Liswood, Secretary General of the Council of Women World Leaders, explores the parallels between human and animal rights in contemporary civilisation and what needs to be done to “hurry history for women”. Recently I attended a symposium on Animal Rights Law sponsored by Denver University Law School. Its purpose was to focus upon extending rights to animals that they have not had under US law. It was fascinating to explore issues of legal ethics, welfare and protection, social norms and change, and the use of the US constitution to expand rights with the focus on nonhumans. To my surprise I found myself creating parallel arguments about women and gender equality as I listened to these legal scholars. One lawyer reminded the audience that the US constitution, in its original framework, only applied to white men: black men, and both white and black women, had to make the argument as to why they should be included. Over the years in American history it has been a Sisyphean task to move certain groups from the ‘things’ category to personhood. Equality and social justice for all were not precursors to the nation’s founding. Women and African Americans could only be heard through those entitled to speak for them. (The parallel argument for animals today is they too have no voice and need advocates for themselves). After many years of striving for women’s equality, global reports continue to show that for most women around the world equality is still out of reach. While not necessarily considered someone’s property, women are still not granted full rights equivalent to men. 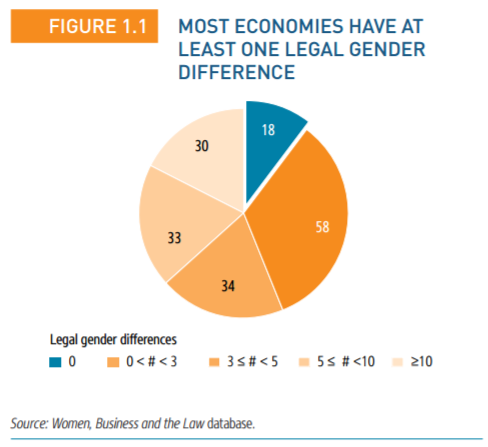 The OECD 2017 report, The Pursuit of Gender Equality: An Uphill Battle, indicates that on average women hold 29% of seats in national legislatures; the median full-time female employee still earns almost 15% less than her male counterpart; and by age 15, boys are twice as likely as girls to expect to work in the STEM fields. The World Economic Forum finds in its 2017 Gender Gap Report that no country has closed the gaps in health, education, economics or politics. In fact, it surmises that closing economic equality gaps is now an elusive 200 years away. My animal symposium raised other interesting concepts that can be related to women’s lives. The capabilities approach, pioneered by Amartya Sen, examines what the full potential of an animal could be and the conditions that limits or diminishes it. This is then expanded to ask what can be changed to improve an animal’s psychological and physical welfare to make the most of its complete capabilities. A dog tied to a tree all day is clearly being diminished not only in its quality of life but the use of its own capabilities. How can laws and justice expand the ability to live more fully? The goal of a rational society is to maximise the capabilities and potential of those within its society. This capabilities approach can certainly be applied to women. A girl who is not allowed to attend school or to receive the same nutrition as her brother sees her capabilities diminished or limited; she cannot use all of her intelligence and talent potential to contribute to society. Professor Martha Nussbaum of the University of Chicago Law School spoke at the symposium about what she describes as “adaptive preferences”: a being will adapt to its circumstances and begin to prefer that, knowing nothing else. She applied this to both her research on animals and her long-time focus on women in developing countries. So an animal in captivity may not scream in pain because it has adapted to its life; but, given the opportunity to live in a wildlife refuge minimally interfered with by humans, it would ultimately prefer that. Working with women in terrible living conditions, Professor Nussbaum asked them if they wanted more education. The immediate response was they would not want to change their substandard state of affairs. Their life was what it was; they had adapted to it and actually created a preference for their conditions. The solution she found was to show and explain to these women what other possibilities of life looked like, confront their fear of change, move to shift societal norms and help them reshape their adaptive preferences toward a fuller life. The women who have experienced harassment represented by the #MeToo movement originally may have hated the abuse but, given the norms of the day, they too often adapted. The seemingly good news today is that these adaptations may no longer be necessary or acceptable. The journey for women’s equality continues. Progress has been made as mirrored by changes in constitutions, legal rights, access to health and educational, political and economic opportunities. But we can look through the prism of the animal rights journey to see how far we have come and how far we still need to go. The real question is, how do we "hurry history" for women – and perhaps even for other beings, too?